Some of the churches in Perthshire contain the most extraordinary things. 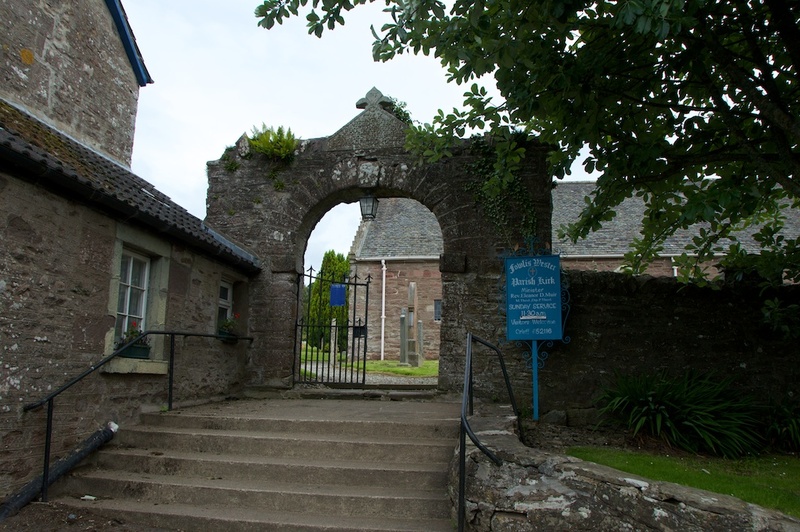 I discovered this a while back, in the little village of Dunning; and it was confirmed again last weekend, when I stepped into the cool shadows of St Bean’s church at Fowlis Wester, a sleepy little village about five miles to the north-east of Crieff. Various sources reveal that St Bean (also Beoan or Beanus) was the grandson of the King of Leinster in Ireland, and lived during the 7th and early 8th centuries. 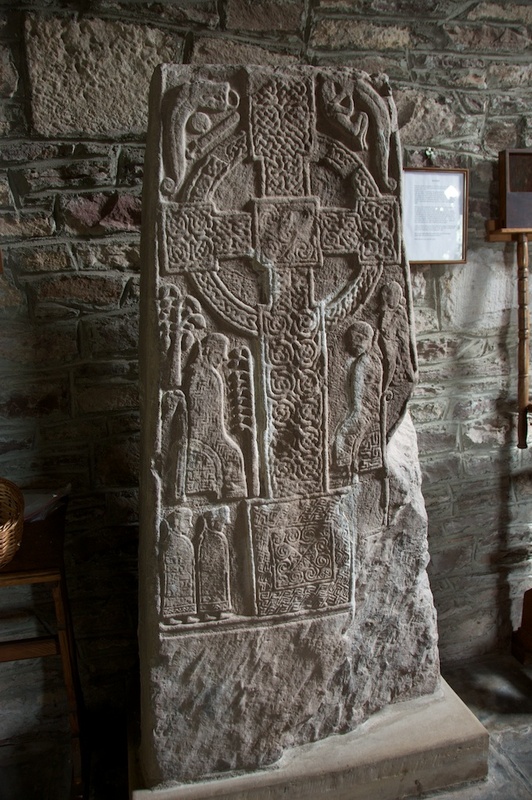 Like St Serf at Culross, and many others, he preached among the Picts, who must have been pretty tough nuts to crack when it came to Christianity. A chapel dedicated to St Bean – perhaps even founded by him – once stood a few miles away, by the River Almond at Buchanty, but all traces of this have now gone. 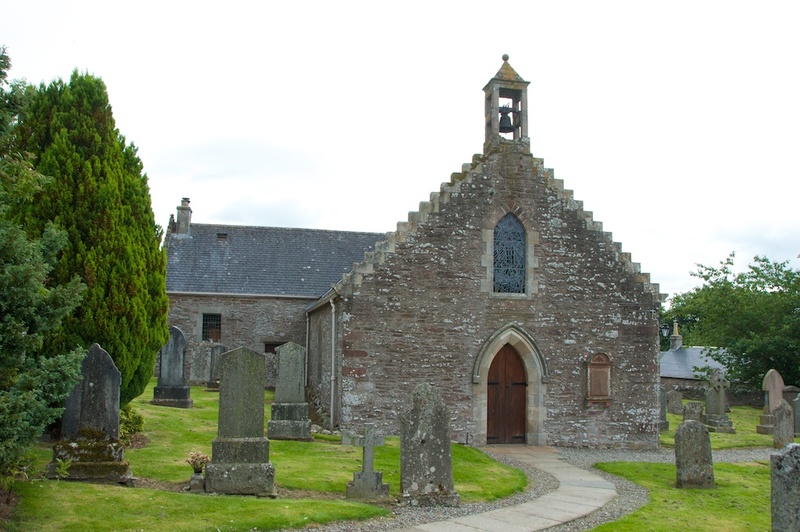 By comparison, the parish kirk at Fowlis Wester is a relative newcomer, dating back to the 13th century. The church is beautiful in its own right, having been renovated in 1927, when many of the alterations made during the 18th and 19th centuries were reversed in order to restore the essence of the medieval building. Inside, it’s simple and light, with bare stonework and an arched wooden ceiling. But I’m looking for something in particular, and I find it in the north aisle, standing like a tall, gaunt watchman, a dark and silent presence from an ancient time: perhaps not exactly a spectre at the feast, but still suggestive of a lion at a tea party. This is the Pictish stone of Fowlis Wester, all 10 feet of it, carved out of a single block of Old Red Sandstone sometime around 800 AD. On the front face is an impressive cross, with nine round bosses in the middle and intricately patterned arms that project slightly out of the body of the stonework. 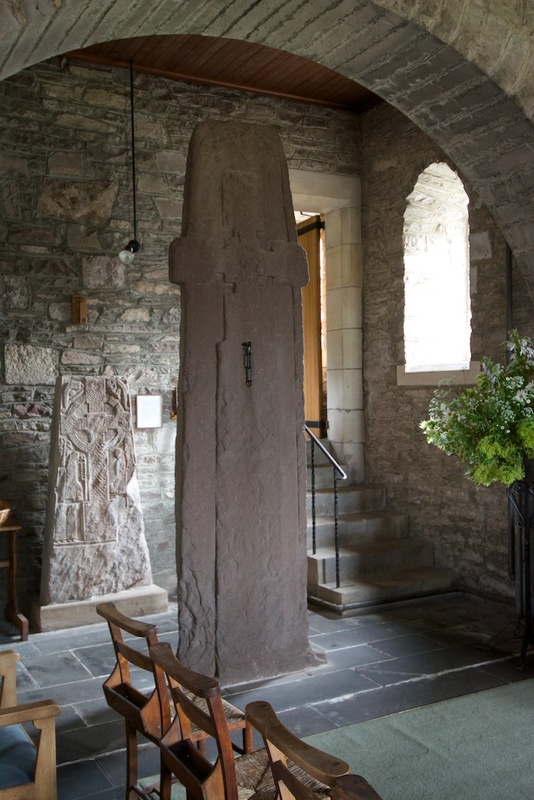 The stone originally stood outside the early chapel at Buchanty, and was re-located to the village green at Fowlis Wester before being moved inside the church; the lower section especially has been eroded by centuries of weather, but it is still possible to catch a glimpse of the beauty of the original carving. It’s a spectacular monument, suggesting devotion and reverence – if the Picts carved this stone, then St Bean had obviously done a good job. But on the back is something far more pagan-looking. 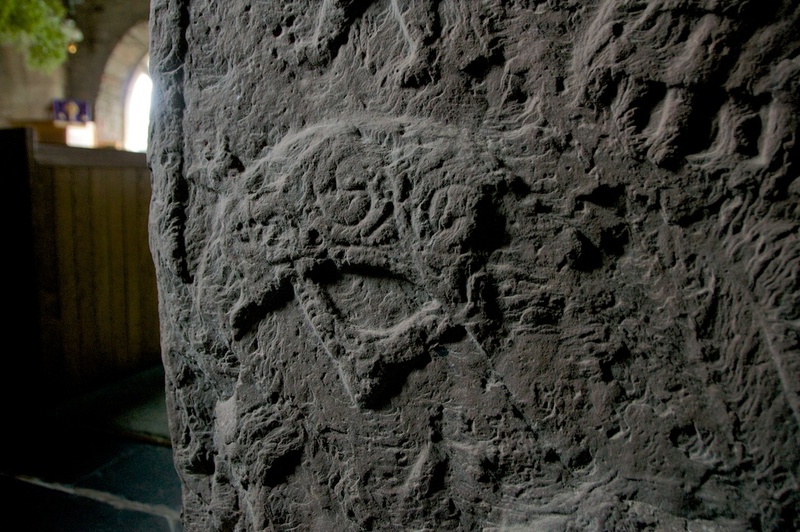 This is apparently the only Pictish stone to have a cow carved upon it, which makes me wonder if it has anything to do with St Bean – perhaps a legend that was connected with him. The figures are beautifully done, large-headed with jutting beards, conveying a sense of action and purpose even after 1200 years. As always, the V-rod attracts your eye with its own magic, bold yet inscrutable, explaining something quite clearly in a language that we can no longer understand. What were the Picts trying to say? Were they playing an early medieval version of Pokemon Go? If they were, the sense has been lost with the re-location of the stone: it’s much safer in its present environment, but if we could find its original setting we might perhaps learn some more. Automatic lights have been fitted in the church, allowing you to examine the stone in more detail; but I prefer the photos taken in natural light. The Picts, perhaps more than any other culture, had a dark side, and this comes across in the shadows. It’s wonderful to trace your fingers around the carvings, and wonder whose hands made them, what they were thinking about, what dangers they faced, and what hopes they carried. By now you may be wondering, as I was, about the short length of rusty chain dangling from the front of the cross. My first thought was that it might have been drilled into the stonework by people transporting it from one place to another, to assist in lifting it. 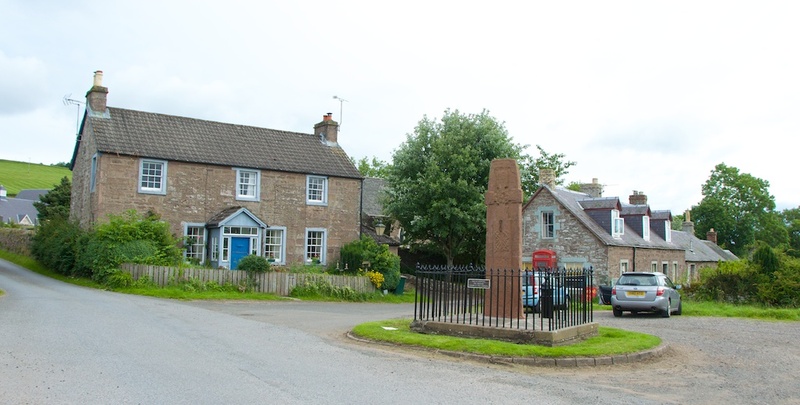 But it turns out that it is the remnant of a ‘jougs chain’, by which criminals were chained by the neck to the stone, and it dates from the time when the cross stood on the village green – so, probably the late 17th or early 18th centuries. This stone has seen a lot of human life, in all its joys and woes. Behind the cross, and standing very much in its shadow in terms of size, is a smaller stone which is certainly worthy of attention. Thought to date from the ninth century, the carving on this piece is astonishingly fresh, and that is because it had been built into the wall of the church, with the carving deliberately protected. It was only discovered in 1927, during the restoration work. The carvings show robed figures, surrounding a cross of intricate beauty. The accompanying information sign says: “At the top of the stone, on the left, is a fish with a dragon’s head and what looks like a Roman sword and shield. On the other side is another ‘fish’ with a wolf’s head and a human figure in its jaws.” You need a certain degree of imagination to make these out. Interestingly, the stone has been damaged at some stage, and a chunk has broken away from the lower right-hand side. Although the carver seems to have made the best of it to begin with, by creating a raised decorative border around the gash, the stone seems to have been later abandoned and its other side was left unworked. This is the theory, anyway: the truth may be stranger. Displayed higher up on the wall are the remnants of a third stone, of which only a couple of small fragments have survived. While I was reading about Fowlis Wester, I was very interested to see that a simple cross-incised ‘pillow stone’ was found beneath a path in the churchyard in 1988. This reminds me of similar stones that have been found in various locations connected with saints’ graves: I remember reading about one unearthed on the Shiant Islands, in Adam Nicolson’s book ‘Sea Room’. There is no tangible link here to St Bean, but it does make you wonder. You can view photographs of it here on the RCAHMS website. 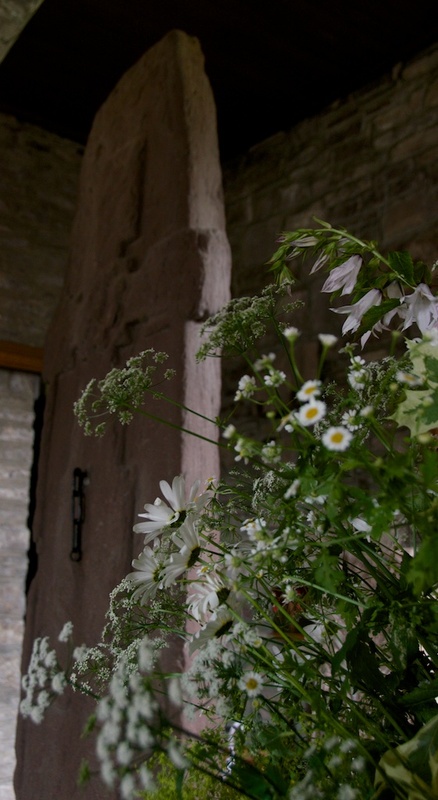 It was lovely to see that the church was decorated with wild flowers – honeysuckle, cornflowers and daisies, pink and white campanulas, and frothy heads of meadowsweet and lady’s mantle. These blooms seemed more in keeping with the fey and half-tamed nature of the stone itself, echoes of the time when it might have stood among them. 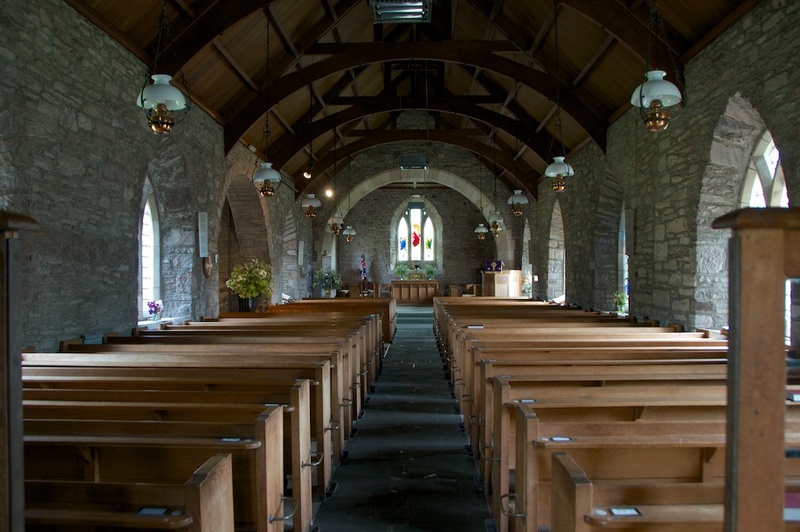 Fowlis Wester parish kirk is open all year round, during daylight hours. More information at Historic Environment Scotland. Footnote: The RCAHMS Canmore entry (1926) states that St Bean was “a saint of British origin”, but I believe that there were two or more saints by the name of Bean or Beoan (cf. Saints in Scottish Place-names) so this may be misleading when applied to Fowlis Wester. Thanks, Pat! I have been wanting to write about this for a long time. It’s such a lovely little church, too, and in a village setting that looks to have stayed the same for the best part of a century. A great post, Jo – one of many, to be sure! I like the detailed pictures of the stone, and your description helps explain its significance. I’m hoping to visit Scotland next year so will definitely put this ancient and lovely church on my list. Thank you, Jeanette! How nice it would be, to be able to fathom who the people were, and what the scenes signify. 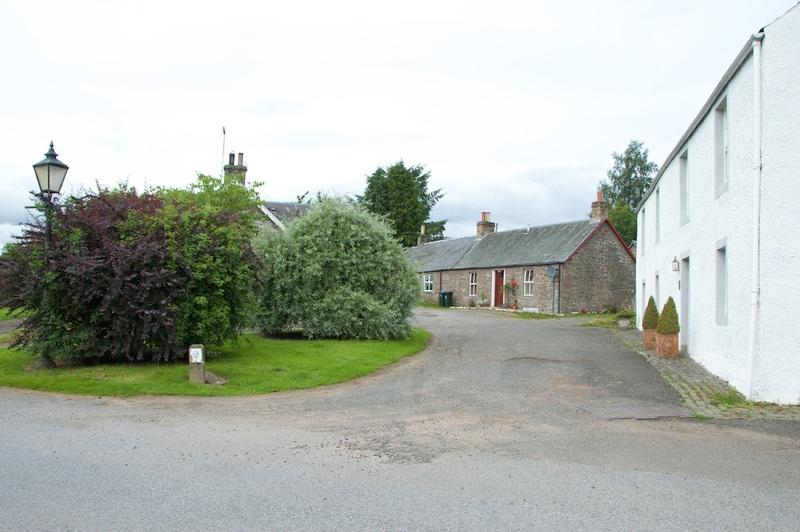 If you are visiting this part of Scotland you might also like to visit Innerpeffray Library which is not far from here – I’ll be writing about it soon. Scotland’s oldest lending library and a wee gem of a place. Very true, Lynne, and by the same token you go to places I’d never get to see. Nice to be able to share them! For me, there is nothing quite like finding a stone such as this inside a church. Enjoyed that, Jo. Those stones and crosses remind me very much of the Viking cross and hogback tombstones at Gosforth Church, near Whitehaven, Cumbria. They were carved when the Norse settlers from Ireland and Scandinavia were being converted to Christianity, and although essentially Christian edifices they are nevertheless adorned with all sorts of pagan imagery. Thanks, Alen! 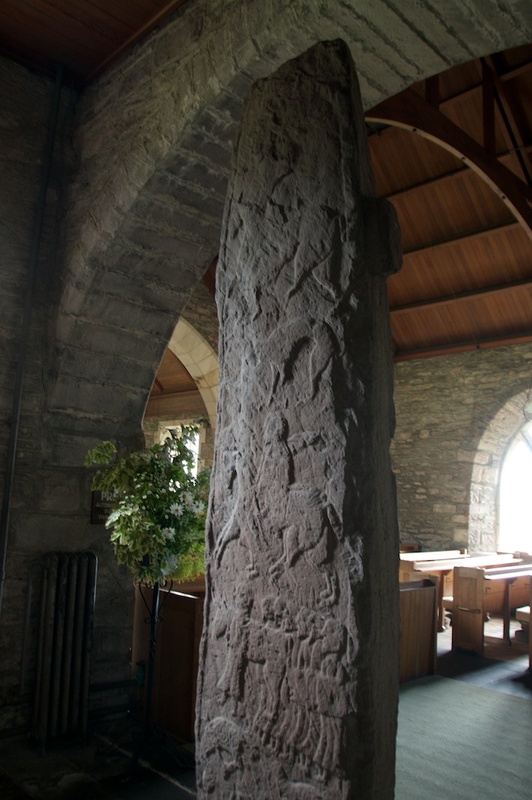 I have just looked up the Gosforth stones, and they are amazing – the cross, so tall and thin, and the hogback stones which are similar to those at Govan but with interesting variations. 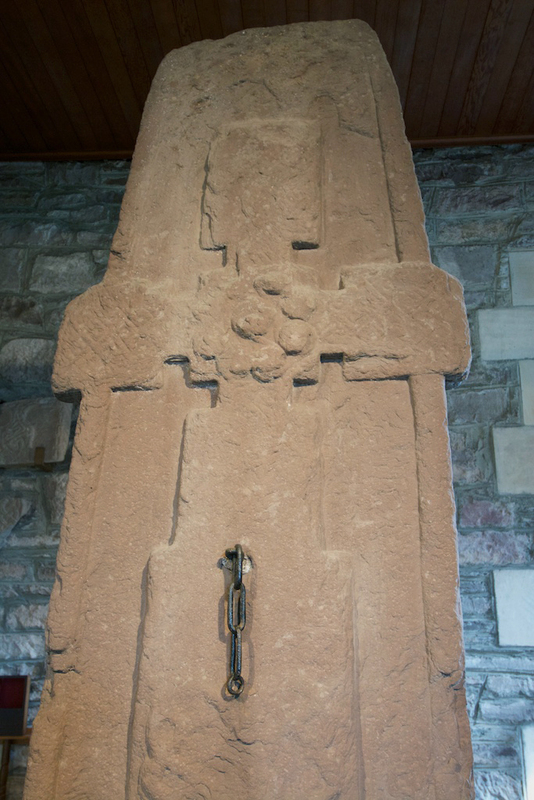 I do wonder about these ‘crosses’ and the same goes for the Pictish ones at Aberlemno and Fowlis Wester – you wonder if they were hedging their bets! The decoration on the hogback stones always intrigues me, with their tiled ‘roof’, almost like the scales of a serpent. Perhaps that was it, Jo – they were hedging their bets. And who can blame them? Magnificent history telling through photograph s work!!!! !